This presentation is an excerpt from the online course “DBT in Practice: Mastering the Essentials”. DBT’s main goal is to help patients create a “life worth living”. The targets and goals of DBT differ for each stage of treatment but the overarching goal in DBT is to help the patient create their life worth living. This goes along with the idea that patients’ lives are unbearable as they’re currently being lived. And it is the therapist’s job to help them develop their life worth living rather than ending life or simply bearing the unbearable existence that they have. As Linehan says, the therapist’s job is to help the patient find a way out of hell. She often describes the experience of patients first coming in to DBT as that of being in hell and having only a metal ladder to stretch out beyond hell and the therapist is there to help coax the patient onto the hot ladder and out of the hell that they’re in. The problem with helping someone get out of a hot place using a metal ladder is obvious. 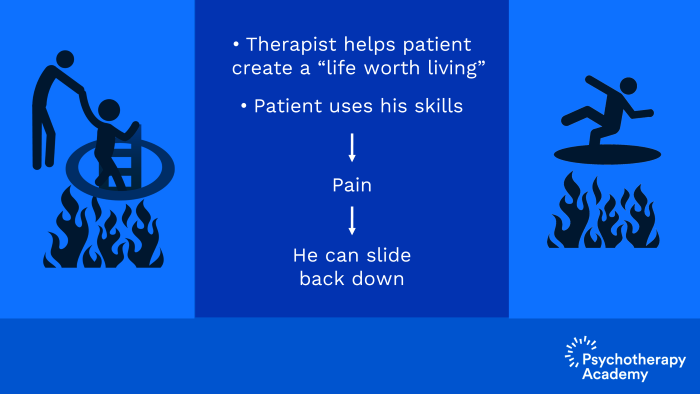 As the patient starts to climb out using his or her skills, it is not uncommon for them to slide back down due to the pain involved in using the skills themselves. In addition, assessment in the beginning of “What does the patient view as being a life worth living?” in and of itself, that exploration can be dysregulating. At the outset of treatment, patients may only be able to list one or two things that they would like to have present in a life that they could see themselves living in, for example, a house of their own, a job or a small white cat. 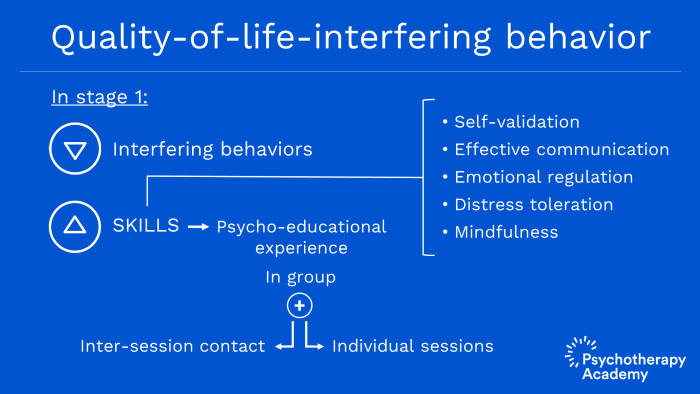 In stage 1 which is the most frequently discussed and studied DBT stage, we are looking at eliminating life-threatening behavior, reducing and potentially eliminating therapy-interfering behavior and reducing what is referred to as quality of life interfering behavior. 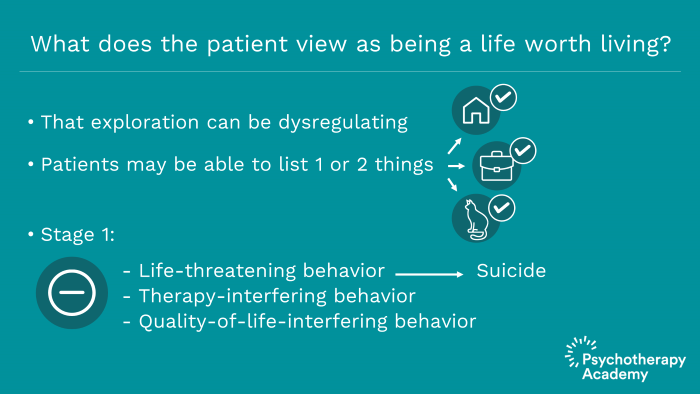 So life-threatening behavior would be things like suicide attempts, suicidal thoughts and urges and any kind of behaviors that are absolutely associated with suicide, anything that would make it more likely that the patient would be at risk for dying or substantial harm to themselves. It is important to differentiate between life-threatening behavior and quality of life interfering behavior. And sometimes, that can be difficult for therapists to determine. Quality of life interfering behaviors would be things like substance abuse, impulsive sexual behavior, impulsive spending, being jobless, being homeless and other very difficult but not life-threatening behaviors such as eating disorders. It is not uncommon for a new DBT therapist to accidentally label a quality of life interfering behavior as a life-threatening one. 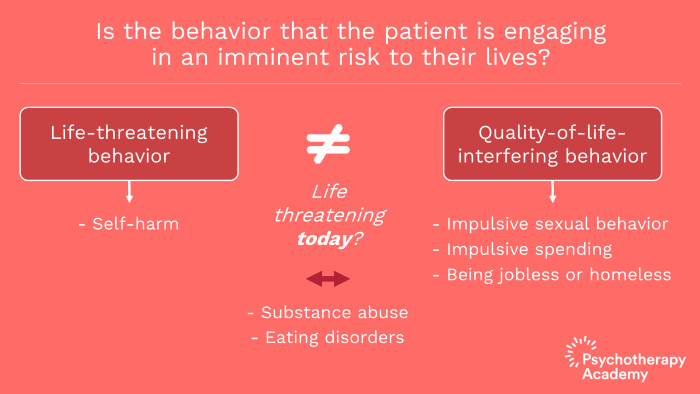 The key to determining what is a life-threatening behavior is to ask the question “Is the behavior that the patient is engaging in imminently a risk to their lives?” So in the case of substance abuse or eating disorders, we would characterize them as life threatening if they were in fact imminently life threatening today. So for example, smoking or drug use would not be considered an imminent life-threatening behavior although it does potentially risk the patient’s life in the long term. So we want to eliminate life-threatening behaviors. Self-harm is also subsumed under this category because of the risk that the patient has to accidentally harming themselves to the point that their life is at risk. In addition, the correlation between self-harm and completed suicide is significant. So beyond life-threatening behavior, we want to reduce therapy-interfering behaviors. And there is a variety of therapy-interfering behaviors that we can work on. Some are behaviors which literally interfere with the process of therapy, for example, missing therapy sessions or arriving late to therapy sessions. Those would literally interfere with receiving therapy. We want to also work on behaviors which increase the risk that the patient is either going to drop out or be terminated from therapy. And that may be arriving late. It may also be things which literally interfere with therapy such as arriving late but can also include interpersonal styles of the patient which interfere with the therapist’s willingness to treat them. It can also be behaviors such as failure to bring homework or follow through on other treatment recommendations that the therapist finds extremely important or concludes to be extremely important. 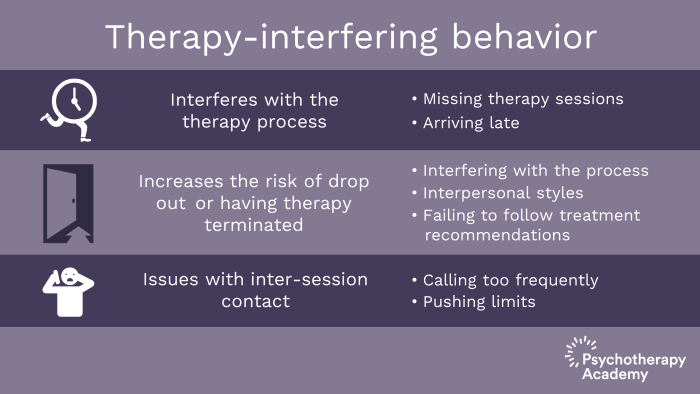 Therapy-interfering behaviors would also include any issues with intersession contact such as a patient calling too frequently or pushing or challenging the therapists limits. Our third set of behaviors is the quality of life interfering behaviors that were mentioned earlier. And we are not looking at completely eliminating quality of life interfering behaviors but we are looking at reducing. In stage 1, we are also looking at increasing skills. So not only are we trying to reduce things but we’re also trying to increase things as well. And in group, this is where it happens that the patient gets a psychoeducational experience and skills. So they are going to be learning how to self-validate, how to communicate effectively, ways in which they can regulate their emotions and how they can tolerate distress. In addition, they will be learning the formal practice of mindfulness. So the skills that they’re learning in group are reinforced by the individual therapist both in individual sessions and in intersession contact. 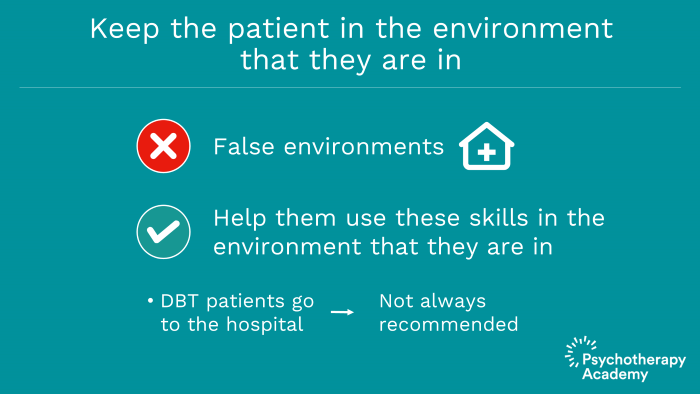 Another of the goals of DBT is to keep the patient in the environment that they are in rather than to create a false environment. Sending a patient to a residential facility or hospitalizing them would be an example of an environment that was not a natural one. So we want to try to help them use these skills in the environment that they are in rather than withdrawing them and putting them in a structured environment that does not exist in the outside world. That being said, it is also not uncommon for DBT patients to go to the hospital. It’s just important to recognize that that is not always a recommendation when a patient is suicidal. 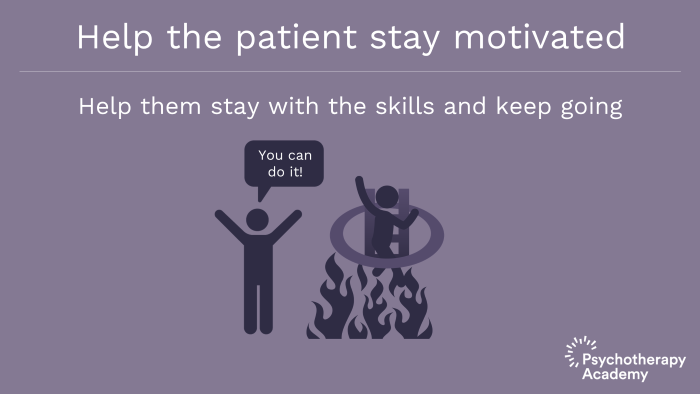 Another goal of DBT is to help the patient stay motivated. So it is the role of the individual therapist particularly in the beginning and at various periods throughout treatment to help motivate the patient and cheerlead him or her in to staying with the skills and to keep going. So again, if we go back to the ladder analogy, the therapist would coax, cheerlead, cheer for and remind the patient why it is so important despite how difficult it is to climb out of hell using a hot metal ladder, how important it is to keep going because the only alternative is to continue staying on in the unbearable environment that they are in. Key points. The key points to video 7 include: DBT’s main goal is to help patients create a life worth living. 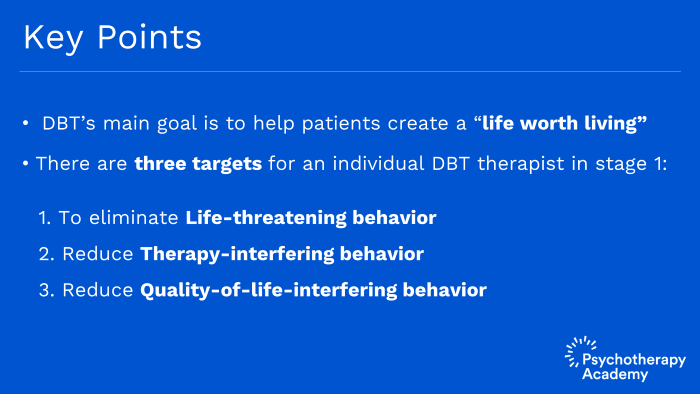 There are three targets for an individual DBT therapist in stage 1: To eliminate life-threatening behavior, reduce therapy-interfering behavior and reduce quality of life interfering behavior. Life-threatening behavior includes suicidal thoughts, urges and attempts as well as self-harm. A behavior is life threatening if it imminently threatens a patient’s life. Therapy-interfering behavior is anything that gets in the way of the patient receiving therapy or makes it more likely treatment will end prior to completion. Examples of therapy-interfering behavior include missing sessions, not completing homework, calling a therapist too frequently and arriving late for session. Quality of life interfering behaviors are anything which interferes with the patient creating their life worth living. Examples of quality of life interfering behavior include substance abuse, impulsive sexual behavior, impulsive spending and eating disorder behavior. What Is the Meaning of Dialectics in DBT? Can you learn DBT and have fun at the same time? Absolutely! All our videos are easy to follow and fun to watch. Get access to a comprehensive and unique learning experience, adapted to your busy schedule. This online course offers up to 5.25 CE/CME credits. © 2018 Psychotherapy Academy. All Rights Reserved.